All you need to do now is dry and fire your pot. I’m not going to go into the ins and outs and whys and wherefores too much. 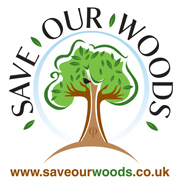 I recommend you get yourself down to the woods and try out the course. But if you did want to have a go yourself* this is a simple guide from which to start experimenting. 1. Warm the clay slowly to minimise thermal shock and breakage. Keep turning pots to maintain an even temperature. 2. Split ash logs to necessary size. 3. 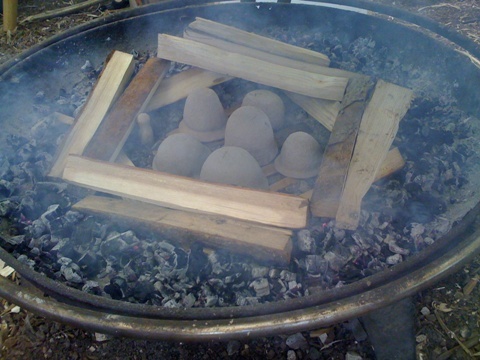 As clay warms, move pots to centre of fire on top of split ash logs. Begin with bottom layer of split ash for kiln wall. 4. 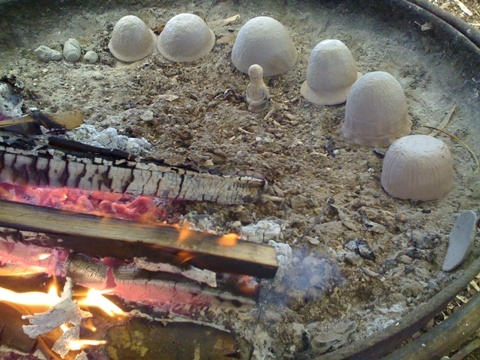 Spread embers around the outside of the kiln and add next level of split ash wall. Keep turning pots. 5. 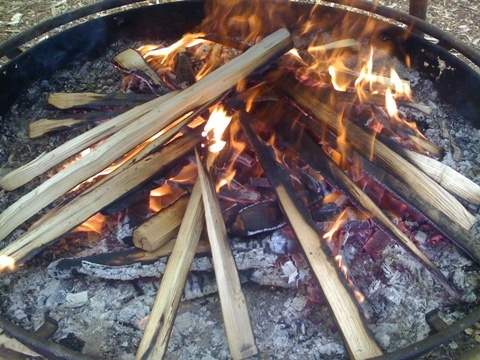 Keep feeding embers with small shavings to maintain heat and add next level of split ash. 6. 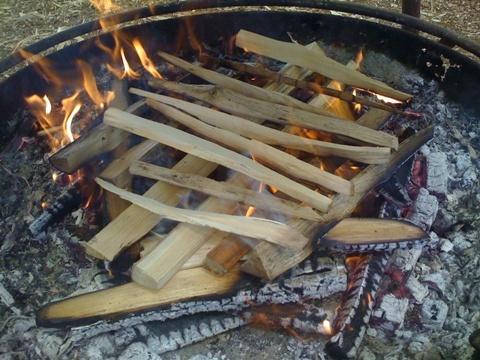 Place smaller ash sticks as a roof over the pots. Leave to “cook” for about four hours or so and cool pot slowly. If you’re lucky and the fire gods are on your side it won’t go pop (or later bam), sounds you do not want to hear when firing primitive pottery. I’ve written a bit more about my experience of Primitive Pottery. *At your own risk. I recommend you try Guy Mallinson’s Primitive Pottery course before going it alone unless you have experience of managing an open fire. Awesome! My little sister makes her own pottery, I’ll pass this primitive kiln advice along. Let your sister know – as she’s building the kiln, keep the flames away from the pots for as long as possible before putting the “roof” on top. Would love to hear about how she gets on. FAB photos ! 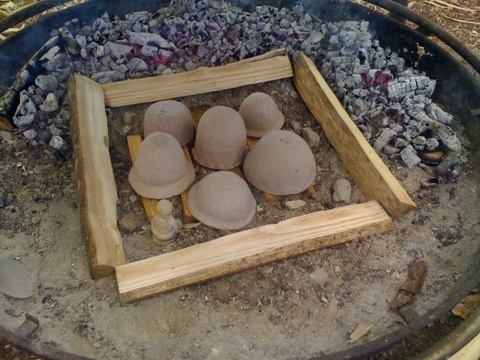 Hey these pinchpots look just like mine, fired in a small pot bellied stove. They are great fun to do and can be made with Raku clay which fires at a lower heat, if you don’t want to dig your own. Any chance you could show a session on glazing them? We glazed the pots before this series of images using the most primitive form of glazing – a small, smooth, round stone. After drying but before firing we carefully rubbed the whole surface area with very smooth pebbles. The more time and care taken over this part of the job, the shinier the pot after firing. This form of glazing also helps with waterproof-ability (the proof was in the cider tasting after the fired pots had cooled). I don’t have any pictures of the process but I think you get the idea that it’s quite simple. Hope that helps. There’s not really much of a recipe. The clay was dug out of the pond, processed and mixed with some ground shells for temper. 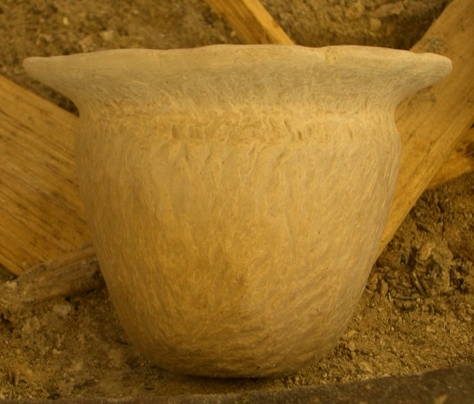 Bit of slip was used as necessary when shaping the pots. Processing the clay is the biggest part of the job. There are more pictures and a bit more of the tale on the Primitive Pottery post. Hi, really like your kiln idea. Can it be used to calcinate metals? I am looking to build one which can do so but using wood instead of gas and electric. Any help or pointing me in the right direction would be greatly appreciated. I was told the temperature was around 1000C in the kiln. But I reckon you’d only be able to do small amounts and it’d probably take a lot longer than firing the pots. It’d take some experimentation and keeping a close eye on the fire to keep the temperature up. I imagine the earliest metalworkers/alchemists could have used such a set up. If you do it I’d love to hear about it. this is a post I hadn’t seen before. I think a lot of people who are interested in traditional skills are somewhat scared of pottery. But this blog shows a really straightforward technique for getting good results. Thanks for sharing. Hi Paul – thanks for commenting. It was an enjoyable couple of days and fascinating seeing the process unfold from pond to pot. How cool is this! I’m interested in traditional firing methods and just getting into ceramics. 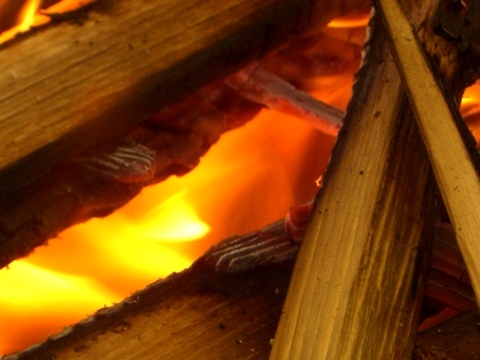 Would a wood BBQ serve as a fire pit? I imagine so if you can get it hot enough. We were using a large metal bowl as the fire pit. I suppose the size of it gave us plenty of room to move things around between the warming process and the actual firing. And the flat base made it easier to build the “walls” of the kiln. Good luck with giving it a go! on December 12, 2014 at 16:43 | Reply Crafting a Green World | The home for green crafts and tutorials! Do you keep “feeding the fire” after the pots turn red? We didn’t. 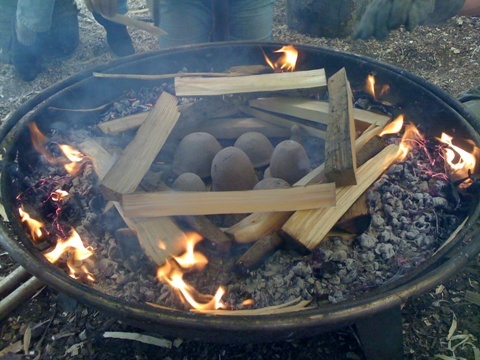 There was enough heat to fire the pots and allow them to cool down gradually as the embers burnt. 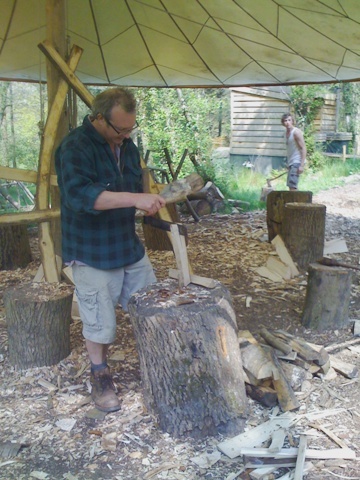 Great idea about sourcing and using waste wood for the kilns. Good luck with the Greek kiln this summer.